Today we’ve an excellent project from our forums to share with you: Jonathon Duerig, known as duerig on the forums, posts about the standalone book scanner he has built, controlled by a Raspberry Pi 2 and using the Raspberry Pi Touch Display as an interface. 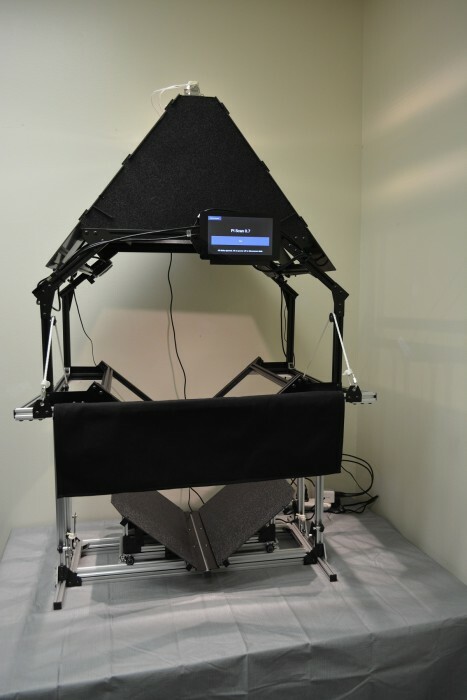 It’s a large and fairly imposing object, based on The Archivist DIY book scanner and using Tenrec Builders‘ open source book-scanning software, Pi Scan. Books rest on a V-shaped cradle that the scanner’s operator lifts up towards a similarly shaped 3mm glass platen by pulling down on a handlebar, thus pressing flat the pages, which are evenly lit from above. The Raspberry Pi controls two Canon PowerShot ELPH 160 cameras, each angled perfectly to capture one of the visible pages of the book. The Pi allows the user to set the zoom level for each camera, automatically sets and locks focus, and captures the images, saving them to an external SD card. The scanner’s touchscreen interface is made with Kivy, a Python GUI development system for touchscreen devices. Looking at this build and the projects it draws on, I was pretty astonished by something that regularly bowls me over when I’m looking at open source projects, and by which I hope I never stop feeling awed. The level of duerig and others’ commitment to the overall open book scanning project and its quality and integrity is remarkable. We are proud that Raspberry Pi is a useful tool to communities like yours and projects like this. I built a much simpler one last year. Its a mounted pi-camera looking down at a table about two feet. And no software, just the raspistill command. Interesting. I am not so much a fan of Google’s digitizing books project, because, well, Google is almost obnoxious on how it pokes into everything they can get their hands on. But that is just me. Whoever reads the comments, could a blog post in the future show what life is like inside Pi Towers? I mean, who does what, what the typical day looks like, some prototype boards for the Raspberry Pi 3 (or 2.1, or whatever)? Running a rapidly growing computer company is never “boring.” Unless I am mistaken. Just watched the videos – I guess in the “Scanning a book” video it might be easier to have a GPIO-connected large push-button on the “handlebar” rather than having to press a specific key on the keyboard.